Ocean Art has been conveniently located in the Hilltop North Shopping Center for 20 years. In that time, we have grown into the premier frame shop in Virginia Beach. Our collection of “Best of the Beach” awards proves that our reputation is well deserved. To achieve the highest standards, we utilize state of the art framing equipment including a computerized mat cutter, vacuum mounting press, and pneumatic frame joiner. Ocean Art only employs the most experienced and educated framing professionals. Great customer service and an outstanding product keep our customers coming back time and time again. Ocean Art has become a recognized business in our local commuinity. Giving back is important. Every year, Ocean Art donates to local schools and charities. Working closely with a local museum, we participate annually in one of the largest art shows on the east coast. To thank our service members, Ocean Art offers a generous military discount. Through all of our hard work, Ocean Art has developed a large resource of local artists and designers. Building relationships with our customers is a top priority. The Virginia Museum of Contemporary Art is pleased to work with Ocean Art. 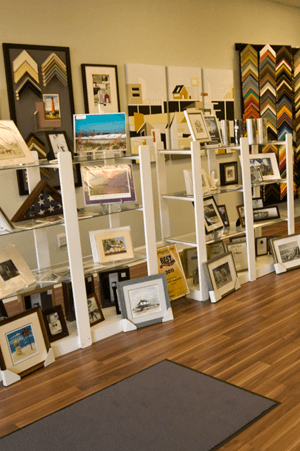 When it comes to framing our coveted Boardwalk Art Show prints, you can't beat Ocean Art for their exceptional attention to detail, quality customer service, and creative framing choices.